Bundles of cocaine seized at the Hidalgo bridge on July 25 are seen. 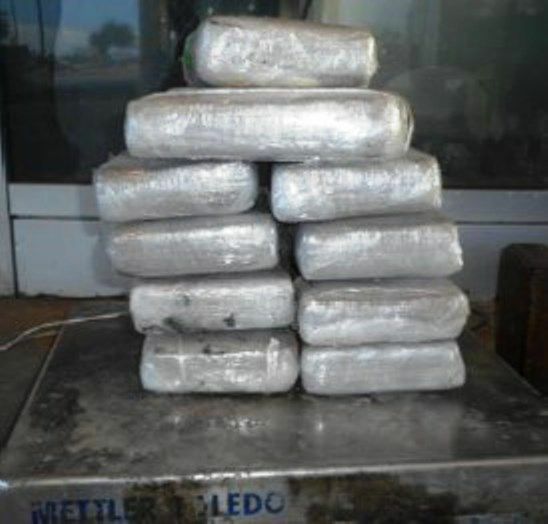 Customs and Border Protection agents seized over 50 pounds of cocaine and methamphetamine in three separate incidents July 25 at the Pharr and Hidalgo International Bridges. Officers at the Hidalgo International Bridge sent a 30-year-old male citizen from Virginia in a 2001 Nissan Tsuri taxicab to further inspection where a canine team helped discover a backpack containing six packages weighing 6.87 pounds of alleged methamphetamine. Later that day at the same location, officers also sent a white 2011 Volkswagen Jetta to secondary inspection. The driver was a 24-year-old woman and the passenger was a 22-year-old man, both citizens from Mission. Physical inspection and a canine team unveiled 10 packages of alleged cocaine, weighing 23.58 pounds. At the Pharr International Bridge, a 20-year-old male citizen from Hidalgo and the gold 2011 Ford Taurus he was driving were sent to secondary inspection. A canine team helped officers find 11 packages containing 20.89 pounds of alleged cocaine. Customs and Border Protection seized the narcotics and vehicles. The drivers and passenger were arrested and turned over to custody of Homeland Security Investigations for further investigation.